Rachel joined the farm in March 2017 as one of two Growing Apprentices. Previously she worked at Sheffield University researching the importance of urban green spaces for biodiversity and people’s well-being. She also organised school trips and outreach events to teach children and the general public about plants, animals and the environment. Rachel is interested in urban food growing as a vital component of urban sustainability, for its health and well-being benefits for urban inhabitants and in providing inclusive, multi-functional green spaces to bring together communities. She worked on a large shared allotment and volunteered in community growing projects, including a therapeutic horticulture project for adults with mental health problems, gaining skills in organic growing and experience in community projects helping a range of people. 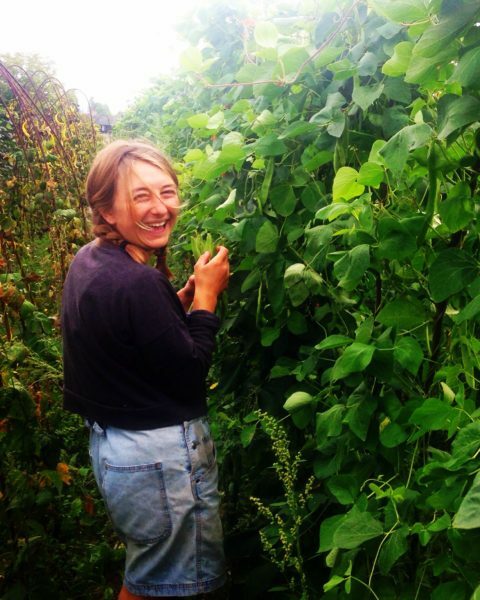 She’s passionate and eager to learn about organic farming, and teach people the joys of growing and eating local veg! Working alongside and learning from Joris and Sam, she is gaining practical skills and knowledge which is leading her to become more confident in growing. She is also getting to grips with the nuances of how a community farm runs, understanding how to manage a growing space and make it financially viable, while also providing opportunities for the local community.